Though it’s easy to think of hard ciders as riding on the coattails of the beer boom, when I stopped by New York City’s Ciderfeast, I was reminded that the cider doesn’t need any help. Sure, ciders can be poured over ice for a Sunday morning hangover cure, but they can also be complex like wine or even hopped like a beer. At Ciderfeast, I indulged in all three. Put together by beer-man-about-town and Jimmys No. 43 bar owner Jimmy Carbone, Ciderfeast certainly had the pedigree to bring in some great ciders. Beyond their CookOutNYC events like Ciderfeast, Carbone’s Food Karma Projects also run larger festivals, like the upcoming ode to pork Pig Island—which will have a cider component of its own. For this event, I was able to try dozens of ciders from 15 different cidermakers fermented in places as far flung as New Zealand (Moa) and as close as Manhattan (Big Apple). Though I’m a firm believer that every beverage has its day, these five ciders caught my attention. As I walked from booth to booth, it wasn’t until I hit Salem, Oregon’s E.Z. Orchards that my mouth really perked up. Despite the addition of pear, the French-style Poire eschewed the in-your-face assault of other ciders with added fruit. Instead, all that lingered were subtle traces of fresh pear riding just beneath a slightly funky mineral dryness that was simultaneously subtle yet engagingly complex. Whereas the Poire impressed me with its delicateness, the Basque from Vermont’s Shacksbury excited me with its aggressive flavors. Crafted in collaboration with a Spanish cidermaker using Spanish apples, this unfiltered, bottle-conditioned cider had both the appearance and pucker-worthiness of a sour lambic, one that finishes long and dry. One of the most unique ciders I saw came from Williamson, New York’s Embark Craft Ciderworks. Their Crab Series Vol. 1 featured a substantial contribution from three types of crabapples, which lent this semidry cider a distinct tannic edge. 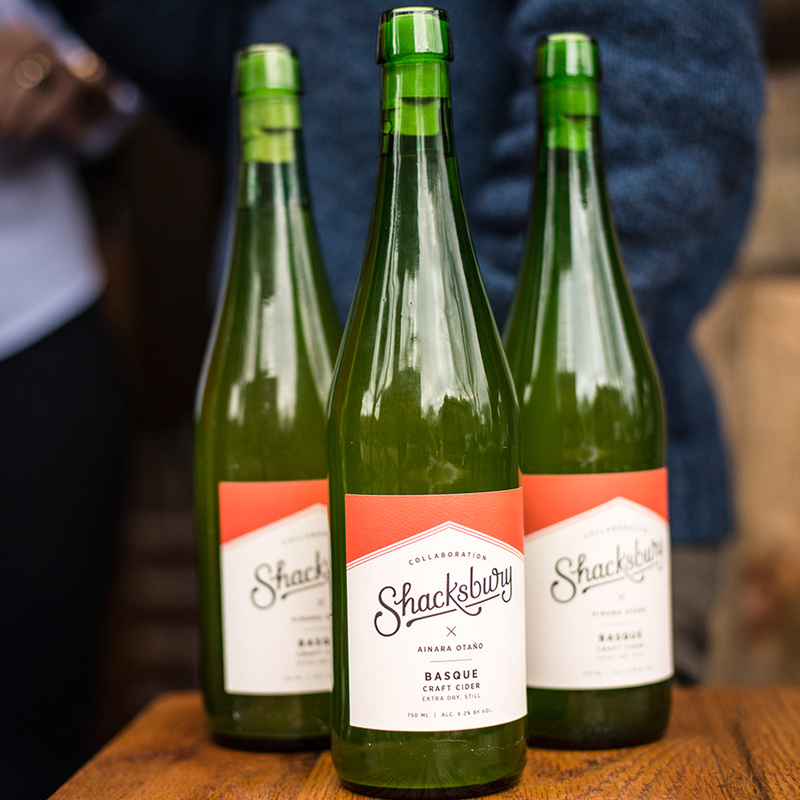 Though, as cidermaker Jacob Lagoner pointed out, the apple flavors come through “first and foremost,” this cider was also fermented with French wine yeast, giving it some floral notes and a finish reminiscent of a dry white wine. Who knew crabapples could be so delicious? All right, but enough with all the fancy talk. When most people who walk into a bar think of cider, they imagine something refreshing, something easy drinking, maybe even something “crushable.” Of all the apple ciders I drank that fit that description, none were as drinkable as Austin Eastciders Texas Honey. Unlike some ciders that can have the mouthfeel of a Clearly Canadian and taste even sweeter, this Texas cider felt big on the palate and well-balanced, with a bittersweet apple character. As I slugged one back, I could almost feel myself turning into a cider drinker. Almost. And if you want any more proof that a cider doesn’t have to be snobby to be interesting, give Boston’s Downeast Cider House’s seasonal Pumpkin Blend a try. I can’t promise you’re going to like it, but I can promise it’s about as close as you’ll come to drinking pure, 5 percent ABV pumpkin spice. Unlike pumpkin beers, where fall flavors compete with malt and hops, Downeast’s light apple cider base allows the flavors of pumpkin mash and seasonal chai spices to ride high. It’s like a powerful pumpkin spice injection for your taste buds and liver. Sure, you won’t want to drink these all year long, but they could definitely be a hit at a Halloween party.